← YALSA’s Teens’ Top Ten Nominees are here! Marty’s parents are divorced from one another and both are remarried. Although Marty’s mom has moved to Mexico City and had a new baby boy, Marty is not angry at her. She feels that her mom is an adventurous soul. The person she is really mad at is her father’s new wife, Linda. Marty lives with her dad and Linda. Her feeling is that Linda exists to wreck her life. She keeps a diary in her senior year of high school and documents everything that Linda does to make her angry. Linda keeps her own documentation of her relationship with Marty through letters to a friend named Paula. they irritate one another over disagreements on sloppiness and responsibility. They have completely different taste in clothes and lifestyles. Even when they are trying to be kind to one another, they misread each other’s motivations, leading to more anger. Linda confesses that she doesn’t have life all worked out despite being an adult. 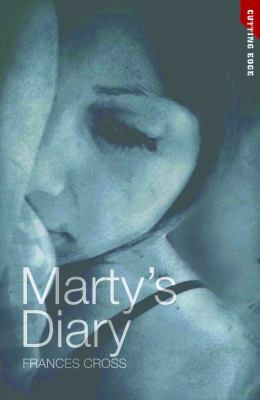 High school housekeeping: Marty’s Diary is part of the Cutting Edge series, a series for struggling teen readers. The Lexile level is 710–so about the fifth grade reading level. It’s a good book about step-relationships for its intended audience as it shows the drama from both sides. However, if you are not struggling with reading, try something with a bit more texture and detail. This entry was posted in Family Problems, Fiction, Hi-Low/Quick Read, Young Adult Literature and tagged book reviews, Cutting Edge series, divorce, hi-low reading, Marty's Diary, parent-teen relationships, siblings, step-children, step-parents, YA fiction, YA literature. Bookmark the permalink.